Walk your way to a healthier, happier you this May by getting involved with National Walking Month. Living Streets is urging people across the UK to leave their cars at home and take to the streets. 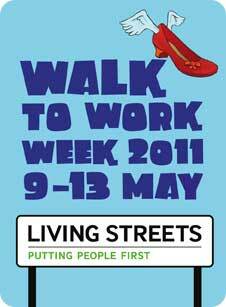 …And from 9-13 May 2011 it is National Walk to Work Week. This is the ideal time to give walking a go. An easy form of exercise requiring no special equipment, walking can be fitted in on your way to or from work, at lunchtime or throughout the day. During the Week you’ll be able keep track of your walking online, see your miles walked and calories burned mount up, and earn online rewards for your achievements. You can even compete with colleagues to see who can be “top walker”. To get more details click here.